What breathes life into MyEpikorean is a love for scrumptious food and in particular, Asian fusion cuisine. Lee's roving tastebuds drive her to create new fusion recipes while her friend and gifted photographer Petties captures it all on camera. Previously, MyEpikorean’s philosophy centered mostly on sharing delicious and healthy Californian Asian Fusion recipes. While we still maintain our philosophy of food as fuel and medicine and feverishly shake our heads at sacrificing flavor, we now recognize that health is about much more than what goes into your mouth or how much you exercise. Our purpose, therefore, is two-fold: first, we intend to continue and provide delicious Asian fusion-style recipes; second, we will offer ideas about how to combine these dishes in a balanced way, creating themed brunches, afternoon teas, or dinner parties for those you love the most. At end of the day, your tummy, heart, and mind should all be sated! What better way to enjoy a sunny, breezy Southern California summer day than an outdoor cookfest with friends and family? Since this is my first post after a roughly year-long hiatus, I thought it would be nice to feature an old recipe in addition to introducing some new ones in a special MyEpikorean Fusion Fire & Fry event. This special event, funded generously by FoodBuzz, marks a new direction for MyEpikorean. Kalamanzis, also known as calamansis or Panama orange, and kochujang, Korean fermented hot red pepper paste, were a running theme throughout the dishes. The kalmanzis added a fragrant zip to aioli and was the star of the desserts. And kochujang added a hot kick to the barbeque sauce and aioli. In this particular post, our main course of special marinated and deep-fried chicken with sweet potato and Okinowan yam fries are balanced by plenty of those yummy anti-coagulents, such as whole roasted garlic, grilled purple onions and pepper, ginseng, gingko and of course, alcohol! We even give your stomach a head start as the apple cider, vermouth, garlic, onion, and pineapple juice in the marinade break down the enzymes of the chicken, tenderizing it. We had two versions of chicken. The first was marinated chicken, battered in sweet potato starch and deep-fried. The second version was the same, except dipped in a kochujang barbeque sauce and grilled. It was nice to have two different versions because we could dip the fried chicken in the kochujang-kalamanzi-garlic aioli or as much or as little kochujang barbeque sauce as our heart desired. I marinated the chicken for over two nights because of my kitchen situation (it is out-of-commission due to remodeling) and had to borrow a kitchen in order to prepare the chicken. I was crazy enough to skin and fillet three whole chickens + a pack of thighs (roughly 15 lbs of chicken), partly because I wanted the carcasses for soup but also because they were on sale. Once I peeled the skin, cut the fat, and removed the bones, these fifteen pounds reduced to about 5 ½ lbs of chicken. You can save yourself a lot of grief by buying pre-prepared chicken. Make sure that the chicken is fresh by checking the date. You can marinate the chicken over one night instead of two, but at the very least, you need to marinate it for a few hours. If you find that you made too much chicken, simply place the extra chicken with marinade in a zip-top baggy and freeze. I usually put as much chicken in the bad as I intend to serve/eat for the week. The day before I want to cook the chicken, I pull it out of the freezer and stick it in the fridge. Originally, I wanted to have candied sweet potatoes and Okinowan yams as one of my two desserts. That was more of a fall dessert though, and with sweet potato already incorporated in the menu in fry form, a second dose of sweet potato might be overkill. Since I did not want to lose the Okinowan yams, I moved them up with the sweet potato fries. The color contrast between the two fries was quite nice, although I think the brilliant purple was subdued by the batter color. Both the Okinowan yam and sweet potato fries tasted delicious with the kochujang-kalamazi-garlic aioli and whole roasted garlic, which popped out of their sleeves, and had a lovely mellow flavor and creamy texture. We ended up having a rather wide selection of desserts because my friends brought some Russian ginger bread cookies, bird's milk (chocolate covered marshmallows), and dried anise-flavored guava in addition to the kalamazi bars and black sesame ice cream. The black sesame ice cream was very easy to make. I took a nice tub of vanilla ice cream and folded in fresh ground black sesame seeds and a sprinkle of finely ground sea salt. For the kalamazi bars, I used King Arthur flour, which has less gluten than other flour brands, and unsalted Plugra butter, which has a higher butterfat content than other butters. These higher quality ingredients made the shortbread-like base extra flaky and buttery. The formatting for this post is a little bit different since I posted multiple recipes. I will repost the recipes individually later for easy searching. Since the focus of this special event was as much about my friends and fun as it was the food, here is a very short-video clip of our outdoor food fest on the patio. Without my friends valiantly helping with last-minute food preparations, dishes, and of course, photography, none of this would have been possible. The person you don't see, behind the camera, is one of my dear friends and the creative genius behind all the MyEpikorean photography. Life is so much sweeter with good friends. Guhn-bae! For the frying, I blended canola and peanut oil- 5 quarts of canola oil + 3 pints of peanut oil. Proportions don’t matter too much. I recommend either canola, peanut, or a blend. Peanut oil has a higher burning point (450) versus canola (400), and peanut also imparts less flavor to the food being fried. Generally, you should keep the oil at 350 degrees for the chicken. 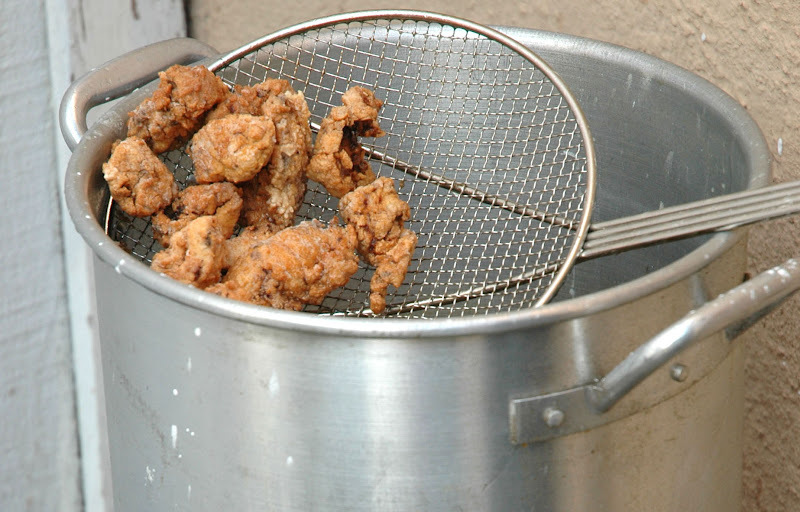 deep-fry the chicken pieces for 4-5 minutes or until a burnished golden brown. Pour the liquid mixture over the baked crust, and bake for another 25 minutes. The most important detail about this recipe is to not to dump the oil in all at once. Combine the garlic, egg, lemon juice, apple cider vinegar, and kochujang in a food processor or blender and puree. Add the oil in a slow stream and continue to process until the mixture has emulsified. I used about 4 1/2 lbs of mixed Korean sweet potato and Okinowan yams. Chop them into sticks roughly 1/4 inch thick. You will need 1 1/2 cups of mung bean or sweet potato starch and ice cold water. Prepare a fryer filled one-third of the way with canola/peanut oil heated to 275 degrees. Fry sweet potatoes and Okinowan yams about 2 minutes. Remove sweet potatoes and yams to paper towel-lined trays, wait till they cool a bit, and then chill in fridge until cold (about 15 minutes). Heat fryer to 350 degrees. Fill a large bowl with the mung bean or sweet potato starch and mix with ice cold water to make a batter. Batter the fries till well-coated. Working in batches, place fries in fryer and cook until coating adheres, but do not brown the fries, about 2-3 minutes. Remove fries to a sheet pan in a single layer, taking care to keep fries separated. Freeze fries overnight. Once fries have frozen, you can preserve them in bags until ready for use. If you are using them right away, just reuse the oil you have and fry them at 350 degrees.